MCLEAN, Va.--(BUSINESS WIRE)--The Friends of Claude Moore Colonial Farm, the nonprofit volunteer entity that funds and manages the Claude Moore Colonial Farm, is launching a public campaign to keep the Farm operating and open to the public. Legislation to keep the Claude Moore Colonial Farm operating and open to the public has been introduced by Congresswoman Barbara Comstock (10th, VA) and co-sponsored by Congressman Donald Young (AK). However, there are concerns that H.R. 5201 will not be enacted in time before the Farm has been closed by the NPS on Dec. 21st and its assets disbursed. In collaboration with Representatives Comstock and Young, Farm volunteers and the community, the Friends are, therefore, launching a campaign in which the public can help to protect and preserve this valuable community asset. While rich in colonial history, historical sites in Virginia such as Mount Vernon and Gunston Hall illustrate the life of a small percentage of the early American population, the wealthy one percent of that era. Most early settlers were, in fact, poor tenant farmers. The Claude Moore Colonial Farm was established by the NPS in 1972 and provides balance and context by authentically depicting the daily work and life of a typical tenant farm family in 1771, just prior to the American Revolution. Since opening to the public in 1973 the Claude Moore Colonial Farm has welcomed and educated over two million visitors, including families, school groups and others from across the country and internationally. The Farm is a privately operated and funded National Park site, relying on memberships, donations, program income, sales and grants as well as other means to sustain its operations. In 2018 the Farm secured the most number of votes to win “Best Museum” in Northern Virginia Magazine’s Best of 2018 competition. Voice Your Support on Social Media: Post your support of the Farm on Facebook, Instagram, Twitter, NextDoor, the Patch and other media sources. 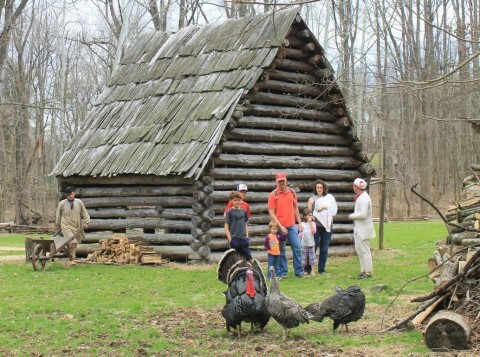 The Claude Moore Colonial Farm is a privately operated and funded National Park site and living history museum. The Farm’s mission is to educate the public about early American daily life and agriculture through participation and involvement in an 18thcentury Virginia tenant family farm as well as through other activities. The Claude Moore Colonial Farm is managed by the Friends of the Claude Moore Colonial Farm, a publicly supported nonprofit 501 (c) (3) corporation under a cooperative agreement with the National Park Service. The Farm was founded in 1972. Please visit www.1771.org for more information. The Friends of Claude Moore Colonial Farm launches public campaign to stop National Park Service from closing living history museum on Dec. 21, 2018.